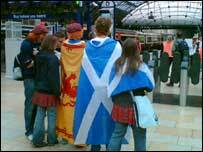 The city of Glasgow is enjoying its "busiest period since the Uefa Champions' League Final" in 2002. 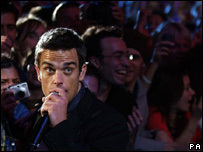 Robbie Williams is performing to 110,000 fans over two days at Hampden Park and Scotland played football at Celtic Park before a crowd of 50,000. The Great Scottish Run will attract 20,000 athletes, while 4,500 delegates are attending a conference involving Europe's leading brain specialists. The events are expected to generate up to £20m for the city's economy. A spokeswoman for Glasgow City Marketing Bureau said it would be its busiest weekend since 2002 when Real Madrid played Bayer Leverkusen in the Champions' League Final. On Saturday, Robbie Williams was playing the second of two sell-out concerts in the city and the national football team beat the Faroe Islands 6-0. The 25th Great Scottish Run will attract more than 20,000 competitors on Sunday. Runners will cross the Kingston Bridge on their way to completing the 10k and half marathon courses. The 10k starts at 0900 BST and the half marathon starts at 1000 BST. About 35,000 spectators are expected to watch the event. Kingston Bridge will be closed from 0500 BST to 1200 BST. There will be a number of road closures and delays are expected. Meanwhile, Europe's leading brain specialists will be in Glasgow for a major conference. Up to 4,500 delegates are expected for the prestigious European Federation of Neurological Societies (EFNS) conference at the Scottish Exhibition and Conference Centre which runs until 5 September.